It’s day three of Lego Dimensions week on Tired Old Hack, and after reviews of the Simpsons and Back To The Future level packs it’s now time for the Portal 2 level pack to be scrutinised to smithereens. Check back on Thursday and Friday for the final two level pack reviews. 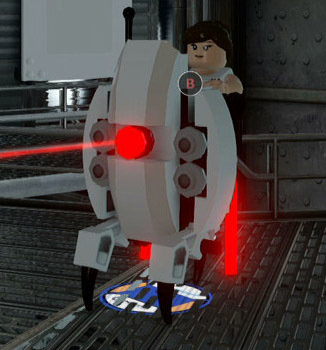 Portal fans are already fairly well catered for in the main Lego Dimensions Starter Pack. The Portal 2 stage in the main story mode is probably the longest in the game, and there’s even an outstanding Portal-related surprise right at the end (click here for spoilers), which would probably be more well-known among the gaming community if more Valve fans played Lego games. So what more can the separate Portal 2 level pack offer that isn’t already covered in the main game? Quite a lot, it seems. The level you get with the Portal 2 level pack is called Aperture Science, though you could probably get away with calling it Portal 3 if you wanted (GLaDOS even describes it as “round three” at one point). Much like the other wave 1 level packs (The Simpsons and Back To The Future), it’s split into four main sections, with the first taking place in a series of test chambers in the traditional Portal style. This section feels most like you’re playing a Portal game, with you using your Portal gun to solve puzzles while GLaDOS continually taunts you and Wheatley offers words of advice. Before long you find an elevator and head down to the second section, where you have to explore the abandoned Old Aperture while old recordings of founder Cave Johnson play over the speaker system (courtesy of new dialogue by Portal 2 voice actor JK Simmons). Make your way through here and you’ll find yourself in the third section, which gives you a bunch of new test chambers to play through, until finally you reach the fourth and final section: a boss battle against GLaDOS herself. 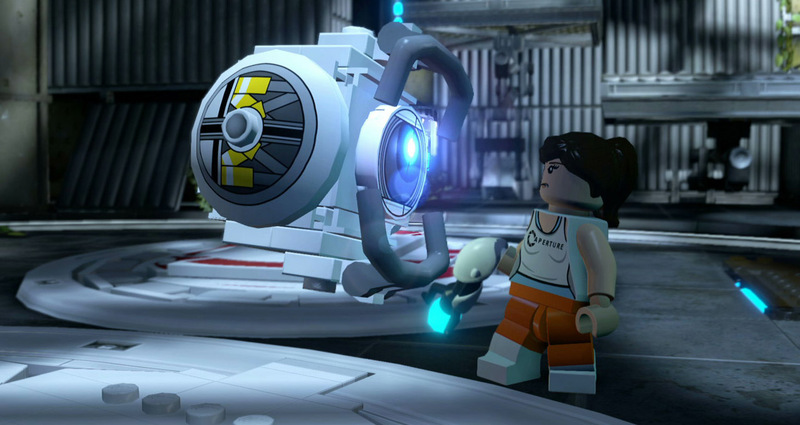 Of all five Lego Dimensions level packs to date, the Portal 2 level is the longest and most puzzle-heavy. Although the environments look a bit samey (which can’t really be helped given the source material), the puzzle design and sensational dialogue still makes the whole thing a treat to play through. The vocal talents of Ellen McLain, Stephen Merchant and JK Simmons all return to voice new dialogue for their respective characters, and you’ll constantly be chuckling away as you play, as is the Portal tradition. The puzzles are perfectly balanced too. Naturally, given that Lego Dimensions is aimed at a younger audience you shouldn’t expect any of the properly brain-bending stuff you would have encountered in either of the main Portal games, but what’s there will give your noggin a wee workout without potentially frustrating any 11-year-olds who happen to be playing. They’re relatively varied too, using not only your portal gun as a mechanic but also the provided Sentry Turret and Companion Cube gadgets, blue repulsion gel, orange propulsion gel and High Energy Pellets (the little glowing balls that are fired and can be diverted to trigger switches in the main Portal games). Essentially, if you’re a Portal fan and you haven’t played this, you’re missing out on a cracking little mini-sequel that may look and play differently but still feels very much like part of the Portal universe. 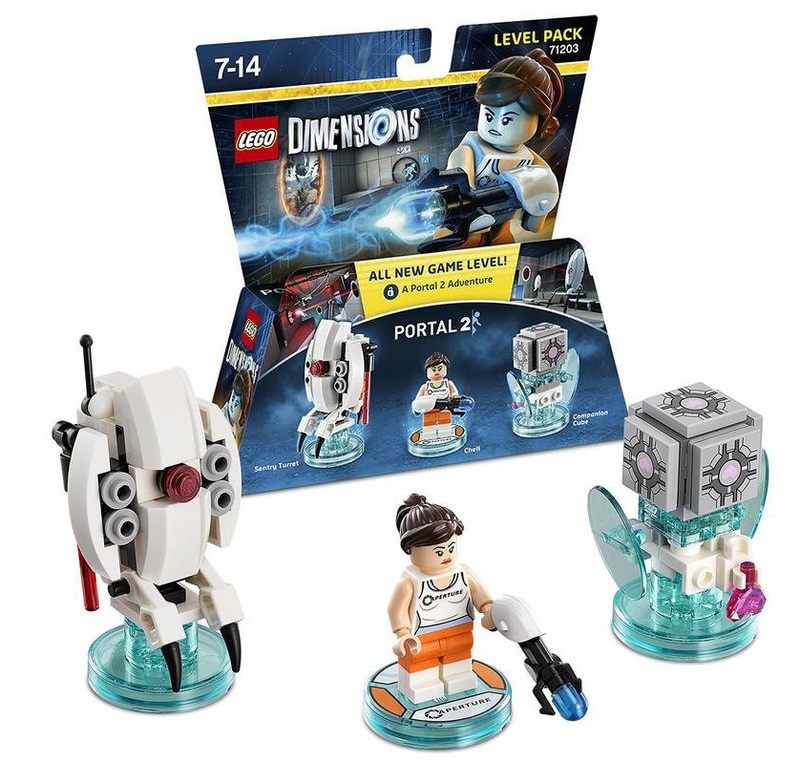 As with all the other level packs, the Portal 2 set also comes with a character minifig and two gadgets. The character in this case is Chell, the heroine from both Portal games. She’s armed with her trusty Portal Gun, which works just like it does in the games: using both action buttons you can fire orange and blue portals you can then travel between. There’s one slight catch, mind: you can only fire portals onto special square tiles. Though this may seem a bit limiting, it’s understandable why it’s like this: Lego game stages are far less complex than Portal stages and being able to teleport wherever you like would have made things far too easy. Thankfully the gun also doubles as a weapon, meaning Chell isn’t too useless outside of Portal environments. She isn’t exactly packed with character though, given that – as in the Portal games – she’s a mute protagonist. Still, the fact she also has WyldStyle’s athletic ability (letting her double-jump and spin on horizontal poles) makes her a fun shooty/flippy character to play as. If you were to write a list of the gadgets and gizmos you come across in the Portal games, chances are the Companion Cube and Sentry Turrets would be near the top. 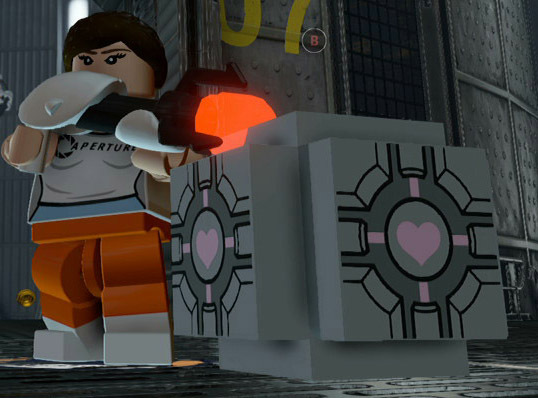 It should come as no surprise then that Lego Dimensions has gone with the safe option, including both with the level pack as Chell’s two gadgets. The Sentry Turret is used in the included extra level for firing at switches, ensuring they stay activated while you run over to the door they’ve opened. Naturally, in other non-Portal stages it’s used to fire at any enemies who have the gall to come near you, and in this respect it gets the job done. When you upgrade it to the Turret Striker it can still fire lasers, but it also runs faster on its little dinky legs and can even bust out physical attacks on closer enemies. A further upgrade turns it into the Flying Turret Carrier. As the name suggests, this acts like a normal Sentry Turret but has the added power of flight, letting you soar around gunning down bad guys like some sort of airborne maniac. The Sentry Turret is a decent enough gadget and is particularly useful in large combat areas where you know you’re going to be faced with a horde of enemies. Its upgrades are nothing revolutionary (the power of flight aside) but it’s a solid enough piece of kit regardless. Plus it looks great in real life once it’s built. Let’s be fair to the developers here – there isn’t a hell of a lot that can be done with a cube. The Companion Cube proves this, offering a gadget that is undoubtedly adorable but stupendously rubbish. In its initial form it does absolutely nothing. Its sole purpose is to be used as a weight you can sit on floor switches. When you upgrade it to the Laser Deflector and realise that it still doesn’t move but can at least now divert lasers towards switches, you start to think “okay, maybe we’re slowly getting somewhere here”. But then you upgrade it again to the Gold Heart Emitter, which removes the laser deflecting ability and does nothing again (other than, well, emit gold hearts), you realise that no, it is in fact rubbish. In a way that’s sort of the joke, so you can’t be too harsh on the Companion Cube. The best thing you can do is buy the small upgrade that lets its follow you unaided and have it accompany you on your quest as a cute little chum. The Portal 2 level pack is easily among the best currently available, blowing the likes of the Back To The Future one out of the water in terms of content. The new level will take you around 50 minutes to beat on your first playthrough (without bothering with collectibles), and is packed with brilliantly funny lines. Meanwhile, Chell’s Portal Gun is a neat little weapon and the Sentry Turret is a cool gadget. Let’s just forget the Companion Cube. It’s also worth bearing in mind that the Portal 2 level pack is the only way of accessing the free-roaming Portal 2 Adventure World, which offers a few more hours of puzzle solving and mission-based gameplay. While the other level packs also offer access to their respective Adventure Worlds, they also have other standalone characters who can unlock them (Bart with the Simpsons world, Doc Brown with the Back To The Future one, etc). Of the level packs currently available, Portal 2 is the only one to feature exclusive access to its Adventure World too. Ultimately, this is a no-brainer for Portal fans. There’s no drop in quality in terms of dialogue here, and while we’re looking at a third-person action platformer instead of a first-person puzzler, the look and feel of the Portal series is still masterfully maintained. This is easily one of the best Lego Dimensions add-ons available. If you want to buy the Lego Dimensions Portal 2 Level Pack and fancy doing it through Amazon, please do it using this link: Amazon UK. It won’t cost you any extra and a cut of the profits will go to me, letting me invest back into improving the site. I thoroughly enjoyed this Level Pack. As you say the script is brilliant and I’d say it, like the Doctor Who level pack, is made with such great reverence for the source material! 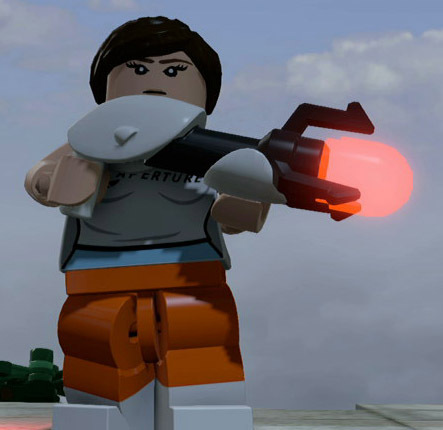 I thought it’s probably worth pointing out that Chel’s portal gun ability is unique in Lego Dimensions, and is essential if you’re looking to unlock all the minikits/gold bricks. The same for the Companion Cube, which exclusively activates certain pressure switches in the main levels/adventure worlds. Great review, looking forward to reading the next two! Do you plan to review the Midway Arcade Level Pack when it’s released? Keep up the good work Chris. As I said on twitter I’ve massively fallen down the rabbit hole this week, but yet to buy anything other than fun packs (very cheaply albeit). Looking forward to seeing the rest of the reviews this week and hopefully the new 2016 stuff later in the year! They are, put I refuse to buy from them and they are cheaper elsewhere and also 3 for 2. I managed to get nearly every fun pack for around £7 each using various deals over last few days. Oh wow! Mind if I ask where from? Only got three fun packs and one team pack to go to get all the character abilities available at the moment and I could do with not breaking the bank! Combination of Amazon UK, Amazon US and Tesco. Amazon messed up and price matched 3 for 2 individual prices for a while and still offered 3 for 2!